Sauli Eerik Koskinen (born March 28, 1985) is a Finnish television host and entertainment reporter from Hyvinkää, Finland. He was the host of Saulin Paras Kaveri lifestyle show which aired on Fox Finland. Koskinen was the winner of Big Brother 2007, beating out nineteen other contestants in a public vote over a fourteen-week period. Before applying for the show, Koskinen worked as a clerk in a Helsinki clothing store. Mikko Räisänen, the casting director for Big Brother, has stated that the decision to put Koskinen in the Big Brother house was made within the first two minutes of his casting interview, crediting Koskinen's positivity, likability and openness. In 2008, fans petitioned to have Koskinen and fellow Big Brother contestant Niko Nousiainen make a return to television. The campaign resulted in the television show Sauli and Niko’s Best Clips, in which Koskinen and Nousiainen provided commentary on viral videos. Shortly thereafter, Koskinen was hired as a web-based entertainment reporter for the Finnish tabloid Ilta-Sanomat, where he provided commentary on entertainment news in weekly Tutka shows with co-host Katri Utula. As of June 2011, Koskinen continued to work for Ilta-Sanomat and was additionally hired as a U.S.-based call-in entertainment reporter for the Finnish radio station Radio Aalto. In 2011, Koskinen and Utula traveled to the United States to produce a special version of their weekly web series entitled Tutka Roadshow. In 2012 Koskinen continued to work for Ilta-Sanomat as a blogger and as the host of Tutka. New special Tutka Roadshow was produced during summer 2012 when Koskinen and Utula traveled in southern Finland meeting Finnish celebrities. In 2013 Sauli Koskinen started video blogging from Los Angeles for Finnish entertainment magazine 7 päivää. In May 2012 Koskinen hosted Näytös 2012 fashion show that was aired live on Finnish national TV channel Yle Teema. In December 2013 Laila Snellman announced that Koskinen had been signed by her modeling agency Paparazzi. He will be available for work as an announcer, actor, and model. On February 28, 2013 Fox Finland announced that Sauli Koskinen will start hosting his own television lifestyle show, Saulin Paras Kaveri. The show was shot in Los Angeles during spring 2013. In the show Koskinen meets Finnish celebrities living in Los Angeles area. The first episode aired on channel FOX Finland on September 14, 2013 and show's guests include celebrities like model Suvi Koponen and chef Stefan Richter. Koskinen is the winner of the first season of Nelonen's Dancing on Ice TV show. On August 21, 2013 it was announced that Koskinen would participate in the Finnish version of Dancing on Ice where ten celebrities learn to ice skate with a professional partner. Koskinen was partnered with synchronized skater Nea Ojala. After the announcement of the celebrity contestants and star coaches, the teams had five weeks to prepare for the first live show. The competition started on September 28 and finale was held on November 30, 2013. Koskinen and Ojala won the competition. Koskinen was in a relationship with American singer Adam Lambert beginning in November 2010. In April 2013, Koskinen and Lambert gave similar interviews in which they announced they had split up amicably and expected to remain friends. ^ "Sauli Koskinen". April 2011. Retrieved 2012-02-06. 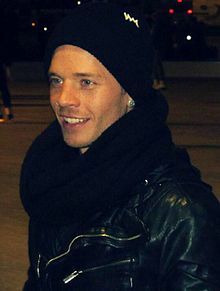 ^ "Sauli Koskinen (28.3.1985)". Retrieved 2012-02-06. ^ "IS-Tutka - Katri Utula ja Sauli Koskinen". Retrieved 2012-02-06. ^ "Sauli Koskinen presents his style to IS - I'm moving back to America". 2011-06-14. Retrieved 2012-02-06. ^ "Radar Road Show". 2011-05-27. Retrieved 2012-02-06. ^ "Sauli's Hollywood". Retrieved 2013-02-04. ^ "Sauli Koskinen video blog". 2013-10-04. Retrieved 2013-08-24. ^ "Sauli Koskinen dates Show 2012-tv program - YleX report to the best of the event". 2012-05-25. Retrieved 2013-02-04. ^ "Paparazzi Lists Sauli Koskinen". 2013-12-16. Retrieved 2013-12-19. ^ "FOX Saulin Paras Kaveri". 2013-03-01. Retrieved 2013-03-03. ^ "Dancing on Ice -kilpailija: Sauli Koskinen". 2013-08-23. Retrieved 2013-08-24. ^ "Advocate.com". Retrieved 19 October 2016. ^ Parsley, Jason (2013-04-05). "Adam Lambert and Boyfriend Sauli Koskinen Split". Retrieved 2013-04-05. ^ "Sauli Koskinen erostaan". 2012-04-09. Retrieved 2013-08-25. This page was last edited on 13 January 2019, at 23:46 (UTC).